Israel Lived in a World Where Evil Was a Reality - Satan was no figment of the imagination but a power to be feared. Israel perceived this adversary of God hiding and lurking in every dark corner awaiting its opportunity to undermine God's plan. Israel Not Immune - The chosen of God were as vulnerable to wickedness as any other people and knew no place to which they could retreat to escape the onslaught of evil's hand. These covenanters became the victim of sin in much the same way as Adam and Eve had become its victims. The Problem - Overcome by sin, the covenant people would carry the guilt complexes which follow a breach of God's moral law. Preoccupied then with their own burdens, they would find it most difficult to minister to the needs of others about them. Yet that was the precise task to which Israel had been called. Atonement Was the Answer - At the heart and core of atonement was the proclamation of the forgiveness of sins. The utilization of forgiveness would make the monumental difference in this people's capacity to be what they were called to be. Just as sin had alienated the covenanters from God, so the forgiveness of sin would reconcile them. Figure carrying burden - Israel. Murky stream - Israel lived in a world where evil was a reality. Spotted tunic, burden, and broken notes - The sinfulness of the chosen ones issued in the same disharmonies as those experienced by the first inhabitants of God's good earth. Extended hands - Israel's mission entailed a ministry to all the earth. 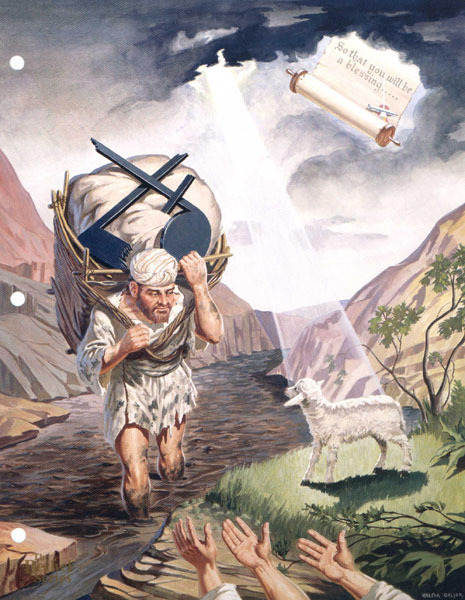 Figure clutches burden - Preoccupied with its own burdens, Israel was not free to minister to the needs of others. Lamb between figure and extended hands - Freed from its own burden by the atoning acts of God, Israel would be free to fulfill its mission. Manuscript message - The atonement of God was designed by him to empower Israel "to be a blessing".